With the risk of rising interest rates and high inflation, an annuity is one of the safest products out there offering tax-deferred growth, death benefit during the accumulation phase, and a guaranteed stream of income for life. Hello, and welcome to another edition of Money Script Monday. My name is Sean Brady, and today's topic is Does your portfolio have too much interest rate risk? Bonds can offer an element of stability to just about any portfolio, and bonds can offer stability, diversification, tax benefits. Bonds are widely considered to be less volatile than stocks, but they're not without risk. Now, in recent history, bonds have been used as a safer alternative in comparison to investing in stock markets. Many people began to invest in bonds as that alternative with the intention of investing in stock markets when interest rates start to rise. However, if you're relying on bond investments for retirement income or to accumulate your assets, you may find that the value of that bond when it comes to re-invest in a new one may have fallen. If you're relying on those bond investments for a certain percentage of your income in retirement, if you get a lower yield, that means you might have to lower your standard of living. 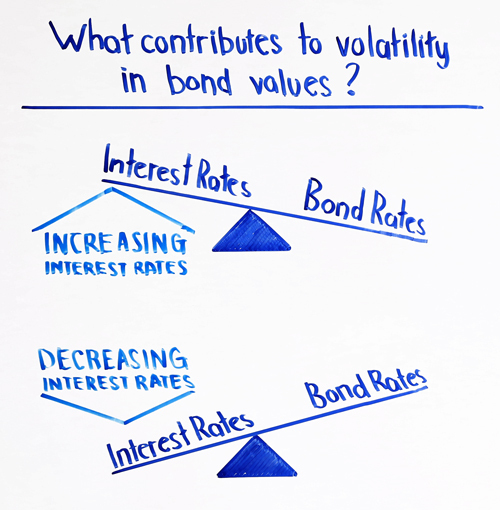 What contributes to volatility in bond values? Now, many factors can contribute or impact bond prices, one of which is the inverse relationship between bond prices and interest rates. Longer-term bonds tend to be more sensitive to interest rates. That's because there's just more time for rates to fluctuate. Now, bond funds are also subject to credit risk and inflation risk. 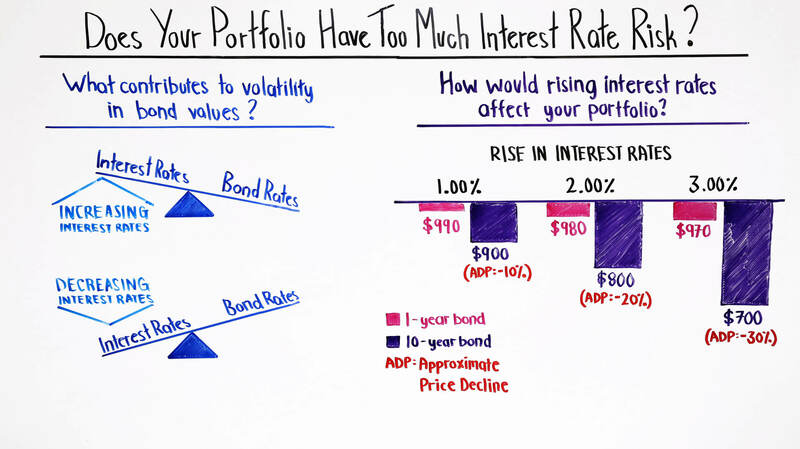 What happens to your portfolio if interest rates start to rise? 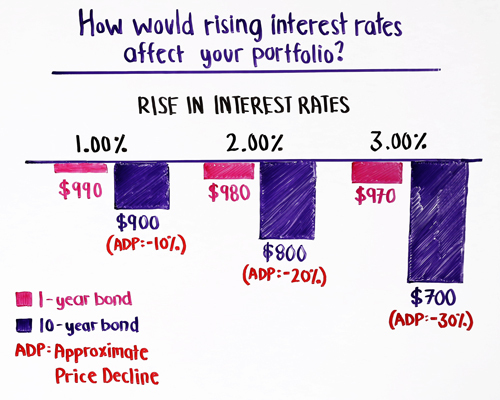 How would rising interest rates affect your portfolio? Now, we've seen a general decline over the past three plus decades of declining interest rates. With that comes newly-issued bonds at lower prices. Interest rates have been at their lowest since the 1950s. In 2013, FINRA issued an alert saying to investors that many economists believe that interest rates are at their lowest, and that interest rates will eventually rise. For those outstanding bonds, particularly the ones with low interests, they could see significant price drops. In 2017, FINRA updated their alert by saying, "Just as some individuals or some people are more sensitive to sun than others, some bonds are more sensitive to interest rate risk or interest changes." If we see this trend of rising interest rates and you have a disproportional amount of your assets earmarked for retirement and fixed income investments, then you may be assuming more risk than you actually realize. Now, this chart is great. It shows a great depiction of what longer-duration bonds and shorter-duration bonds and how they relate to interest rate risk as well as price volatility. You'll notice that longer-duration bonds tend to have more interest rate risk and higher price volatility. That's because shorter-duration bonds, they're the ones that can be re-invested at a much quicker pace at those new, higher rates. Longer maturity bonds tend to have longer durations. Let's say, for example, you have a bond fund at $1,000. And we're just looking at the one-year bond, one-year duration. If there's an interest rate increase of 1%, you're going to notice that bond decline by 1%. If interest rates increase by 2%, then that bond is going to decrease by 2%. 3% increase in interest rates equals an approximate 3% decline in that bond. Now, let's take a look and see how a 10-year bond is affected by those same interest rate increases of 1%, 2%, 3%. A 10-year bond would see a decrease in 10%, 20%, 30%. If you're 5, 10 years out of retirement, you might not be able to take those types of losses. With inflation risk that comes with rising interest rates, your purchasing power could be greatly affected as well. Now, one such solution possibly to be used by a portion of your retirement assets are annuities. Annuities offer tax-deferred growth, a death benefit during the accumulation phase, and a guaranteed stream of income for life. Contact your financial professional to see if an annuity is appropriate for you. Thanks, and we'll see you again next time on Money Script Monday. Sean Brady is an Advanced Case Designer at LifePro. 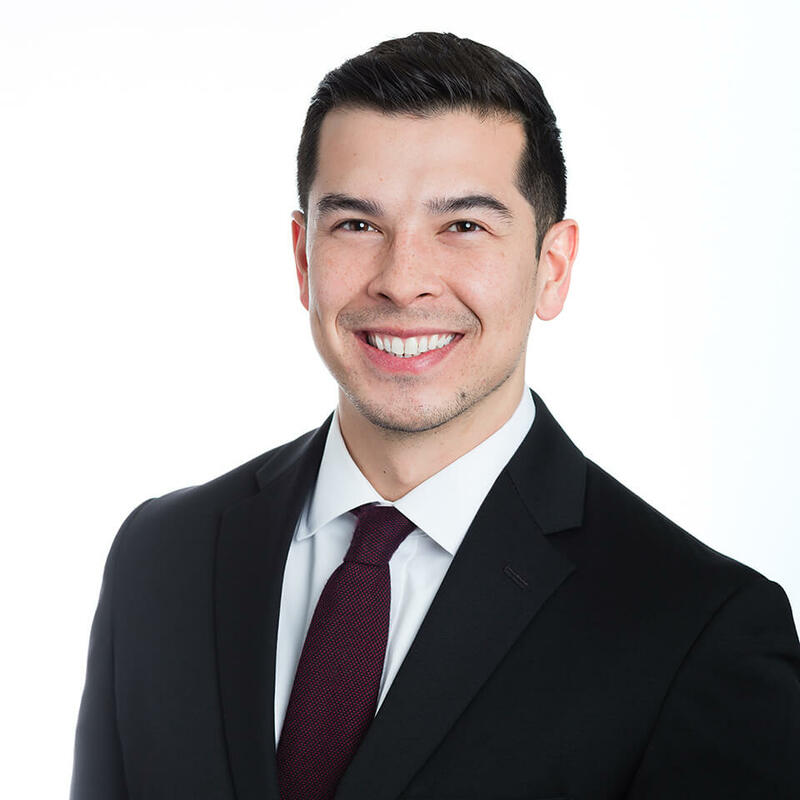 He works with financial professionals designing advanced case illustrations that are built for longevity and are always in the best interest of the client.